President Maduro said the agreements “are perfectly aligned” with the country’s economic recovery plan. 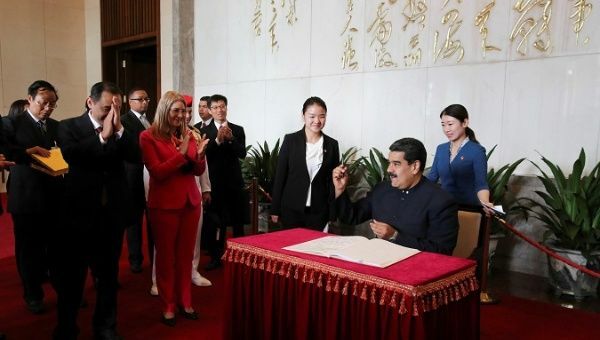 Sept 14 (teleSUR) China and Venezuela signed 28 bilateral strategic cooperation agreements in the areas of oil, mining, security, technology, finance, and health during the closing ceremony of the XVI High-level Diversified Commission meeting in Beijing Friday. In the extractive sector, the countries signed an agreement to strengthen cooperation between China’s National Corporation for Gas Exploitation (CNODC) and Venezuelan Oil Company PDVSA to explore and extract gas, and another agreement with Chinese company Yakuang Group for gold exploration and extraction. In the health sector, they signed a memorandum of understanding between Chinese tech company ZTE and Venezuela’s Health Ministry. Economic relations between China and Venezuela have been strengthened since 1999 when Hugo Chavez first took office in the South American country. During Chavez’s first official visit to China, the two countries established a diversified energy commission and agreed on loans and construction contracts. In 2001, the high-level diverse trade commission was created to promote cooperation agreements in several economic and social areas. Today, China has positioned itself as one of Venezuela’s most important commercial partners. Maduro said the agreements are “perfectly aligned” with the country’s economic recovery plan, which has sought to stabilize the Venezuelan economy and combat the effects of the United States and European Union-led economic war and financial blockade.